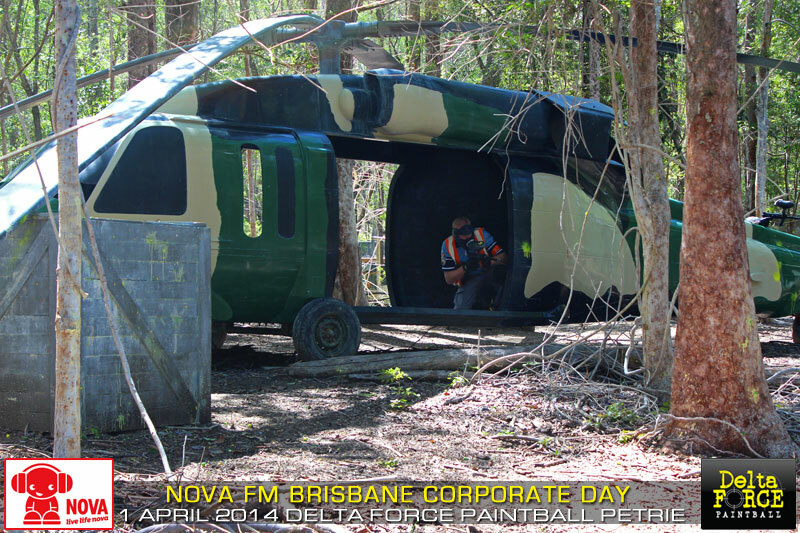 The NOVA FM team in Brisbane rocked up at Delta Force Paintball Petrie locked and loaded for a two-fold assault on Tuesday April 1. Mission one was take Fraser from Daisy Hill out to the Black Hawk Down game zone and stand him in front of the full scale Black Hawk chopper dressed in the Delta Force std issue combat gear, and sing Pavarotti. Sounds simple enough, albeit tough in full head protective headgear. However, have the Delta Force Paintball staff, using one of their highly accurate upgrade paintball guns, unload on him while he’s singing and you’ve got seriously extreme karaoke indeed. As the video shows, Fraser bravely sung on as the paintballs found their target time and time again, to the amusement of the onlookers. Fraser’s finale was highlighted with a twist of resolve amidst several low-blows that definitely set this karaoke mission apart from others. 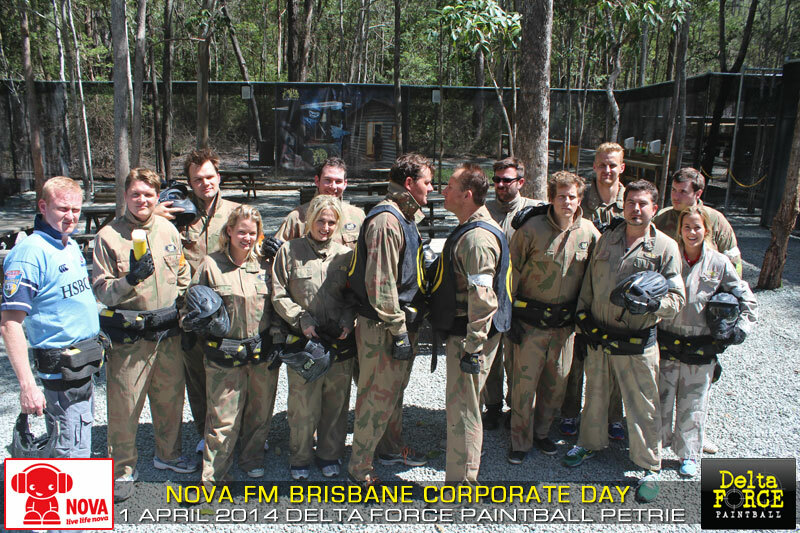 Mission two was a short corporate event for the NOVA FM team, comprising of well known morning presenters Ash, Kip and Luttsy, the film crew and the marketing team all bursting to enjoy the amazing facilities on offer at Brisbane’s best paintball centre. After filming and recording Fraser’s performance, the Nova team underwent several hours of team building battle exercises on the incredible movie themed game map Black Hawk Down themselves. Operation Assassinate The President had the whole Nova crew in stitches as Ash, as team captain of his team, the Voodoo’s Vigilantes, was sent out with a huge target literally on his back. He’d later comment, “Wow this place is amazing, best paintballing I’ve been to.” Even the Nova girls, Mandy, Abby and Ange had a blast and were quick to defend the appeal of paintballing to girls as well as guys on air during the morning show the next day. Luttsy, the die-hard Queenslander was nominated as ‘The President’, and therefore number one target, for having the gumption to wear a NSW Waratahs rugby jersey and was absolutely hammered out there because of it. The upgrade guns on offer at Delta Force Petrie (and used against poor Fraser during his Pavarotti extreme karaoke moment) featured in the Nova FM combat also. 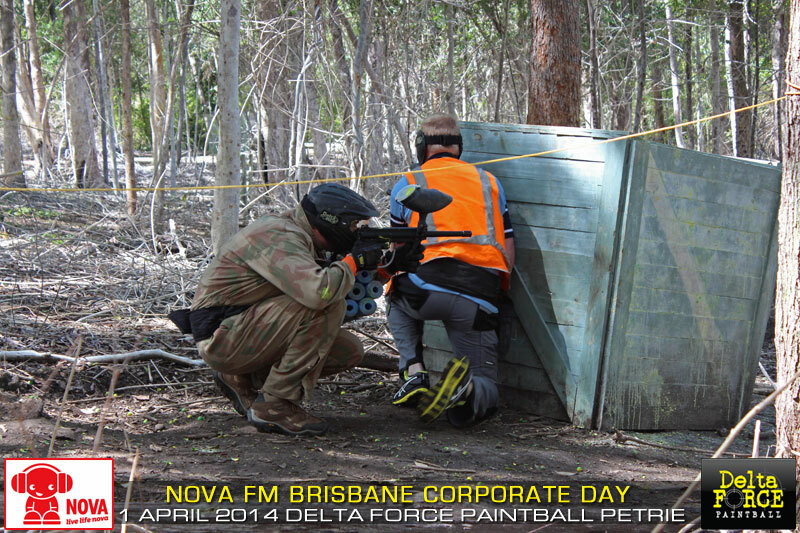 Station manager, and the captain of the 2nd Nova team, KJ had a quiet word with the Delta Force staff earlier and made sure that his team was outfitted with the superior rapid rate DYE Proto Rail guns to ensure they had the firepower advantage on the field.Â It’s safe to say, the Nova FM team from Brisbane had a day they won’t soon forget and will remember with great excitement.